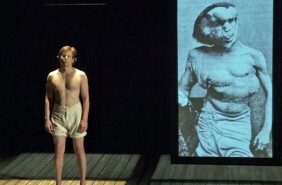 Bradley Cooper plays The Elephant Man, without prosthetics………….yeah right! But he does, contorting and twisting his body to mirror the physical afflictions of John Merrick as he is paraded in a freak show. It is at this stage that we are only afforded a view of Merrick behind a curtain or under his hat and long coat. How deformed will he look? Discarded by his unscrupulous manager, Merrick is beaten up at Liverpool Street Station but by chance, staff find the business card of Frederick Treves (Alessandro Nivola) in his pocket. Treves takes pity on Merrick who knows him as an engaging, intellectual individual despite his disabilities and houses him in the London hospital. Standing before us, Bradley Cooper in just shorts (someone clapped briefly, American we think, in their traditional theatre way) starts to twist his body and adopt a tortured look as Treves explains his afflictions by pointing at Merrick’s actual photograph. All manner of celebrities including royalty are eventually invited to drop by and be associated with this unusual but enthralling character. Merrick grows particularly close to Mrs Kendal (Patricia Clarkson), a fading actress and friend of Treves, she transfixes him with her femininity. Cooper is just brilliant in this taxing role and we didn’t once think we were only looking at an actor, it was as if The Elephant Man himself was on stage. Whatever shortcomings the storyline or other actors had the end result was a resounding success, endorsed by the immediate standing ovation by the entire house.